KL Gross-Rosen (Groß-Rosen) was a German concentration camp, located in Gross-Rosen, Lower Silesia (now Rogo?nica, Poland). It was located directly on the rail line between Jauer (now Jawor) andStriegau (now Strzegom). 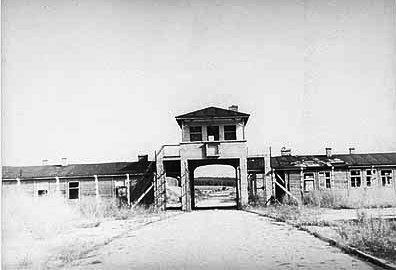 It was set up in the summer of 1940 as a satellite camp to Sachsenhausen, and became an independent camp on May 1, 1941. Initially, work was carried out in the camp's huge stone quarry, owned by the SS-Deutsche Erd- und Steinwerke GmbH (SS German Earth and Stone Works). As the complex grew, many inmates were put to work in the construction of the subcamps' facilities. Gross-Rosen was known for its brutal treatment of NN (Nacht und Nebel) prisoners, especially in the stone quarry. The brutal treatment of the political and Jewish prisoners was not only due to the SS and criminal prisoners, but to a lesser extent also due to German civilians working in the stone quarry. In 1942, for political prisoners, the mean survival time was less than two months. Due to a change of policy in August 1942, prisoners were likely to survive longer because they were needed as slave workers in German industries. Among the companies that benefited from the slave labour of the concentration camp inmates were German electronics manufacturers such as Blaupunkt or Siemens. Some prisoners who were not able to work and not yet dying within a few days, were sent to Dachau in so-called invalid transports. One of these, Willem Lodewijk Harthoorn, an inmate from the end of April to mid-August 1942, wrote an account of his experiences, Verboden te sterven (in Dutch, meaning Forbidden to Die). The largest population of inmates, however, were Jews, initially from the Dachau and Sachsenhausen camps, and later from Buchenwald. During the camp's existence, the Jewish inmate population came mainly from Poland and Hungary; others were from Belgium, France, Netherlands, Greece, Yugoslavia, Slovakia, and Italy. A total of over 500 female camp guards were trained and served in the Gross Rosen complex. Female SS staffed the women's subcamps ofBrünnlitz, Graeben, Gruenberg, Gruschwitz Neusalz, Hundsfeld, Kratzau II, Oberalstadt, Reichenbach, and Schlesiersee Schanzenbau. A subcamp of Gross-Rosen situated in the Czechoslovakian town of Brünnlitz was a location where Jews rescued by Oskar Schindler were interned.